To protect the computer from viruses and malwares, there are plenty of best free antivirus software and malware programs. There are several antivirus programs available for Windows operating system which one can install on a system to scan all the possible viruses/malwares and eradicate them. Microsoft Security Essentials is the official antivirus program which is developed by Microsoft for Windows operating systems. This antivirus program is available for all the versions of Windows operating system. There is no doubt that Microsoft Security Essentials is a great tool for removal of viruses and malwares but it has been seen that a service which comes under Microsoft Security Essentials consumes very high resources. MSMpEng.exe is the service which runs while Microsoft Security Essentials is running in the background. This leads to high CPU usage which results in slow processing speed and ultimate hanging of the system. If you are experiencing msmpeng.exe high CPU usage issue then it is due to Microsoft Security Essentials running on your computer. Today, we are going to tell you how to fix MsMpEng.exe high CPU usage issue on your computer but before we share the guide we would like to tell you what is msmpeng.exe first. MsMpEng.exe is one of the most important processes which come under the Microsoft Security Essentials. This service will scan all the files which are downloaded on your system and if there is any suspicious file is seen in the scan, it will remove it or quarantine it. This service also scans for the possible spyware infections present in the system which can be Trojan or worms. In short, msmpeng.exe is responsible for all the scans which are done under Microsoft Security Essentials, and removal of all the possible threats which are present on your computer. Now as you know what is msmpeng.exe, let’s find out the methods to fix MsMpEng.exe high CPU Usage. (i) There shouldn’t be any other antivirus program installed on your computer. Make sure Microsoft Security Essentials is the only program installed on your system. (ii) If you are using Microsoft Security Essentials on Windows XP, then you have to simply uninstall this program as there is no support available for Microsoft Security Essentials running on Windows XP. Within a few weeks of question answer session at ZeroDollarTips.com, many Windows user has asked us the almost similar questions like How to solve high CPU usage of Microsoft Security Essentials? What are some best methods to fix MsMpEng.exe antimalware service executable high memory usage? What is msmpeng.exe and how to fix MsMpEng.exe high CPU usage problem? etc. Close all the programs which are running on your Computer and reboot it. As your computer is booting, press the F8 key. Hold the key until you see the Windows Logo on your computer screen. In some time, you will see Windows Advanced Options on your computer screen. 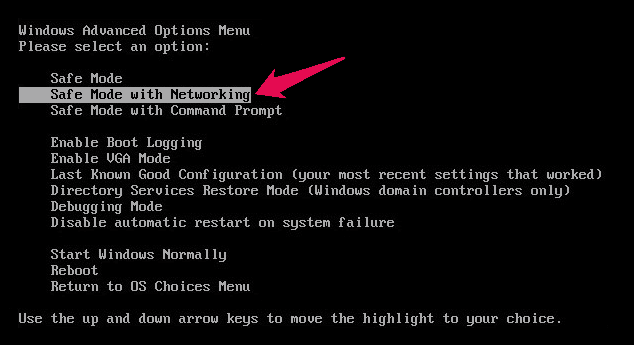 Here you have to select Safe Mode with Networking and press Enter. By following these steps, you will enter Safe mode with networking on Windows XP, Windows Vista, and Windows 7 operating system. Press combination of Win + R keys together to open Run dialog box. Now you have to enter msconfig in the run window. Go to the Boot tab and then check Safe Boot and Network options from there. Select OK button and then reboot your system. Now as you have entered Safe mode on your computer, you have to download a program called Rogue Killer (Basically, RogueKiller is a security tool which helps you to terminate and remove malicious processes and programs from your computer.) which will help you in finding the possible malwares and fix MsMpEng.exe high CPU usage issue. Step (1): First of all, Download RogueKiller Software on your computer. Once the RogueKiller software is downloaded on your system, open it by double clicking on it. Step (2): A pre-scan will take place. Wait for the pre-scan to complete and once it is done you have to click on the Start button which will start a complete scan of your computer. Step (3): Once Scan is complete, click the Delete button which will remove all the viruses and malwares located during the scan. After the malwares which were detected are deleted, reboot your system. You won’t get msmpeng.exe high CPU issue on your system. Now, let’s see other MsMpEng.exe antimalware service executable high memory usage solutions. If you are using Windows Vista or Windows 7, go to Start → Control Panel. Windows XP users, go to Start → Settings → Control Panel. Windows 8 and 8.1 users, open Run dialog box by pressing Win + R keys. Enter control panel in the run dialog box. Add or Remove Programs in Windows XP. Programs and Features in Windows 7, Vista or 8. 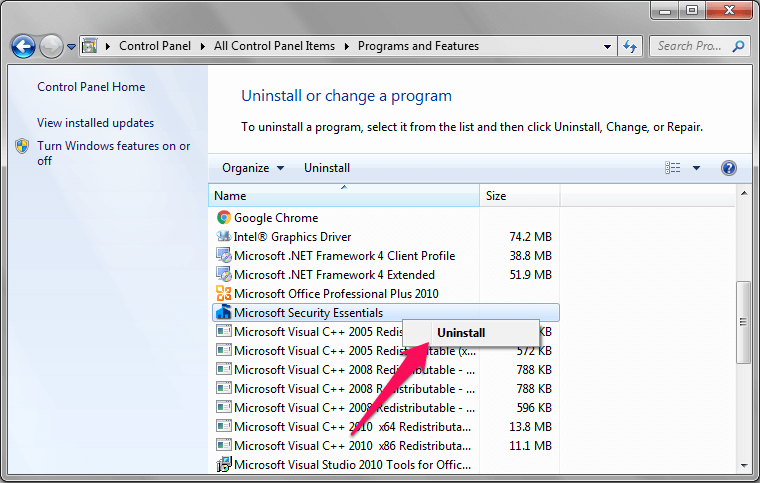 Now, Uninstall Microsoft Security Essentials from your computer and once it is uninstalled, reboot your system. Once you have successfully uninstalled Microsoft Security Essentials from your computer, go to the Microsoft Security Essentials Download page in order to Download Microsoft security essentials latest version and reinstall it on your PC. That’s it! Step (1): At first, you have to open Microsoft Security Essentials on your computer. Once the app is opened, click on the Settings button. Step (2): Now you have to select Excluded files and locations button located on the left side of the app. Select Browse option. Step (4): Once you find the file, select MsMpEng.exe and then click on OK. Step (5): Next, click Add button to add the selcted file. Step (6): Once the file is added, now select Save Settings button. Step (7): Finally, Reboot your computer and as the file is deleted, it will solve msmpeng.exe high CPU usage problem. That’s it! 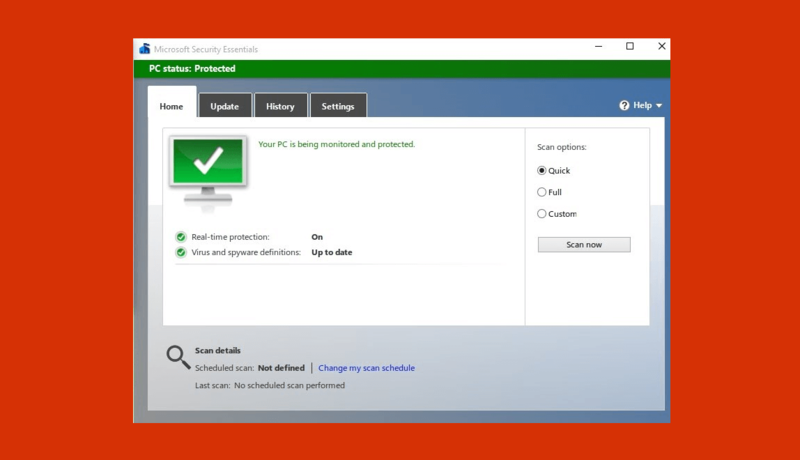 You can reschedule the Microsoft Security Essentials scanning time when you are not working so that it does not halt the processing speed during your work hours. Follow the steps for rescheduling the times to msmpeng.exe antimalware service executable. Open Microsoft Security Essentials on your computer and then select Settings. 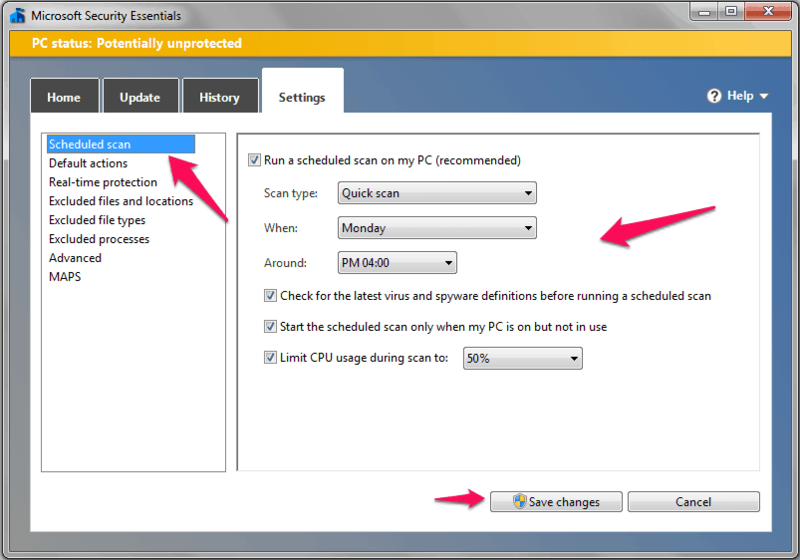 Select Scheduled scan option which is located on the left side. Here you can select the time and date when you want to start the scan. Once you have selected the time and date, click on Save Changes button. You can now check and see if there is still the issue of msmpeng.exe antimalware service executable high usage. If it is there you can disable the real-time protection on your system. Select Real-Time Protection option which is located on the left side. Here you have to uncheck “Turn on real-time protection (recommended)” button. Click on Save Changes button. Close the software and check if msmpeng.exe high memory issue is still there. If there is still high memory usage issue, you can disable the app. Open Run dialog box on your computer by pressing Win + R key. Enter msconfig and open Startup tab from here. 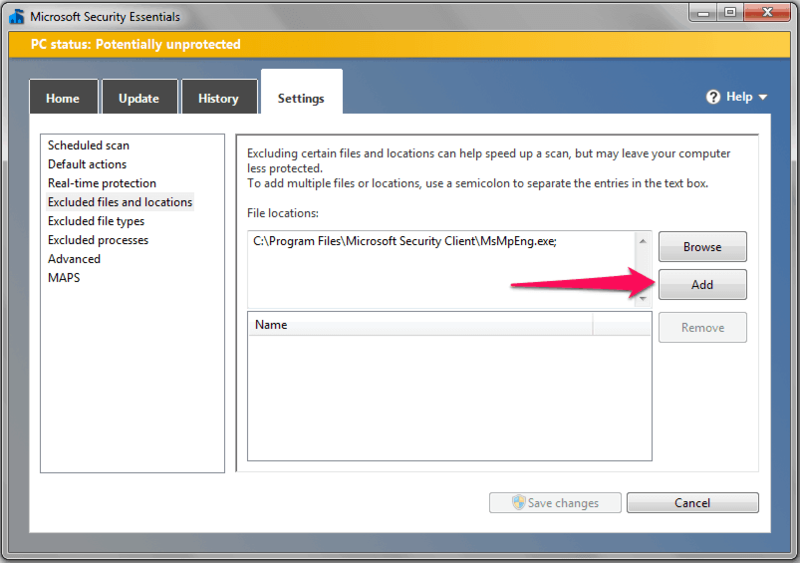 Uncheck the box which says “Microsoft Security Client”. Click OK button. Finally, reboot your computer and Microsoft Security Essentials won’t start. As we have disabled Microsoft Security Essentials on the computer, there is no chance that there will be high CPU usage issue. The above methods which we have shared above to solve msmpeng.exe high CPU usage are tested and all works very fine. Once you have followed any of the above-mentioned steps correctly, you won’t experience MsMpEng.exe high CPU usage anymore.